Urban Veda is a natural skincare brand that use the theory of Ayurveda to provide plant-based skincare products that leave the skin feeling balanced. 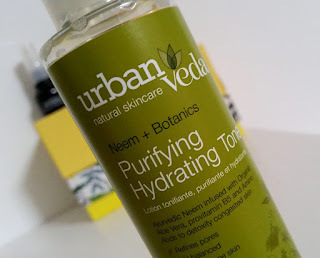 Today I will be reviewing the Urban Veda Purifying Toner which is targeted at those with a kapha dosha, or oily skin. In case you haven't heard of Ayurveda I will try to explain it rather quickly and briefly. Ayurveda is an Indian, whole-body healing system that was created thousands of years ago. It is about promoting good health, and health and wellness is dependent on the balance between mind, body and spirit. Ayurvedic theory is based upon the idea that everything in the universe is connected, and "good health is achieved when your mind, body, and spirit are in harmony with the universe”. It is also said that each individual is created from five elements of the universe: water, air, fire, space and earth. These elements then combine together create three energies called doshas: Vata (space and air), Pitta (water and fire) and Kapha (earth and water). Everybody is said to have a dominant dosha, but keeping them in balance will help to promote wellness. In regards to skincare, we can look at these as skin types. Keeping our skin balanced is the result that we are all after, and knowing your dosha will help you choose the right Urban Veda products for you. To make things a bit easier on that front, Urban Veda have a questionnaire on their website to help you find your dosha. The Purifying Toner is ram packed with botanicals (organic aloe vera juice, neem, quassia, rosa damask flower water and witch hazel) that help to tighten pores, hydrate, reduce shine and of course, tone. It also contains vitamins (vitamin C and proVitamin B5), six bio-oils (tea tree, eucalyptus, wild mint, spearmint, orange and anise) and amino acids that are full of antioxidants to help provide the skin with a healthy glow. It comes packaged in a clear, plastic bottle with a press cap to dispense the product. The bottle then has a green label around it with product info which matches the other products targeted at those with a kapha dosha. After cleansing, dispense some of the toner onto a cotton wool pad and gently stroke it across the face and neck. Leave it a moment to let the botanical oils absorb into the skin and then continue with your moisturiser. Upon application you get an instant cooling effect on the skin. It’s lovely and refreshing and you know that it’s getting straight to work. Give it a minute and pores start to look less visible. Not totally disappeared, but less noticeable for sure. It has a slight tightening effect on the skin, but not an uncomfortable type of tightening like you get if your skin is dehydrated. I find that it leaves the skin looking balanced with a healthy glow and it does a good job at helping to keep oil at bay throughout the day. It may be a tad worrying hearing the word “glow” in association with claims of “keeping shine under control”, but there is a difference and it is a nice one. Some may find it a little annoying having to wait for the oils to absorb into the skin, particularly if you are in a rush, but it doesn’t take long for it to do so. I usually do something else in the meantime and then come back to my face routine as to not waste time which is an idea if you are one to be in a hurry in the mornings. The only downside of the toner for me isn't really a fault of the product itself, but the packaging. Personally, I think that the lid should probably be a simple flip cap rather than a push cap as this type of lid is better suited to cream type products. It makes dispensing the product a little awkward as you have less control of the flow of it and it can be easy to use too much. 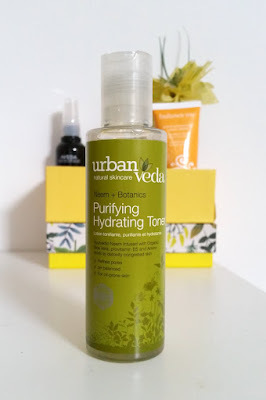 Overall though, I really enjoy using the Urban Veda Purifying Hydrating Toner. It helps to keep shine away and it makes the skin feel good too. As a side thought, this is also one of those products that is particularly great during the summer due to it’s cooling effect, and if you are looking for an extra cool sensation you could always pop it into the fridge before use. 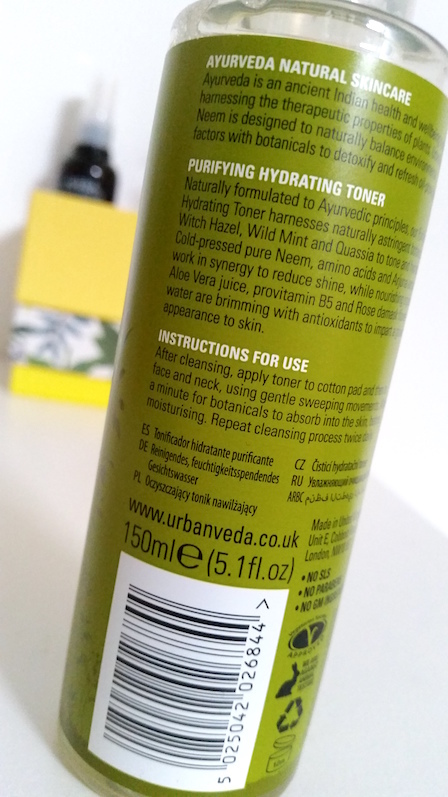 You can purchase the Urban Veda Purifying Hydrating Toner for £12.99/150ml from Love Lula. What are your thoughts on the Urban Veda Purifying Hydrating Toner? What is your dosha?